Ten days ago we relaunched our company site, Logic By Design, the feedback we have received has been amazing. In the last ten days we have had 7,000 visitors from 118 countries and only 1% were using IE6 (hooray!). We were also featured in cssmania.com, thebestdesigns.com, wpinspiration.com, mostinspired.com, & designfridge.co.uk. We built our site as a platform, so everything on the site is content managed even the images in the header and it is all powered by WordPress. On that note, a month or so back I was asked to speak at WordCamp Miami, WordCamps happen all over the world and they allow WordPress users of all skill levels to meet/hear others using WordPress. WordCamp Miami was this past Saturday and what a great time. It sold out a few days before the event and the venue at the University of Miami was fantastic. I was batting leadoff for the day (9 am start), so I expected not that many people to be able to make my talk… we started a little late but the room of about 100-150 was packed. 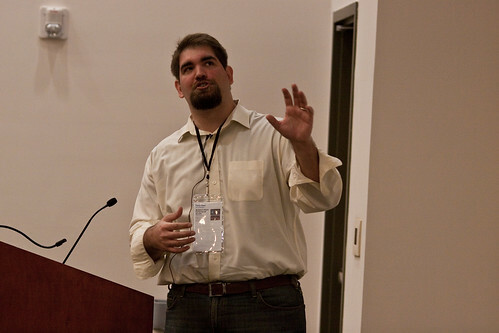 My talk was about the plugins we use at LBD to help keep all of our clients on the same platform, WordPress. Based on the people that came up to me and the feedback on twitter everyone really appreciated the talk, which makes me so happy. My goal was to keep the talk fast paced and cover a lot of ground so hopefully no matter the skill level they were able to learn something. Update: Video of my talk.